Inflammation and oxidative stress are important events among the plethora of mechanisms involved in cisplatin (CDDP)-induced nephrotoxicity. 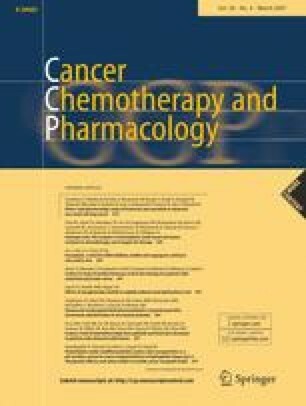 The aim of this study was to evaluate the effect of mycophenolate mofetil (MMF), an immunosuppressive, in the protection against CDDP-induced renal dysfunction. Rats were divided into four groups; untreated-control group, CDDP-treated group (7 mg/kg, single intraperitoneal dose), MMF-treated group (40 mg/kg/day orally for 5 successive days) and the fourth group was treated with both drugs and MMF treatment was started 1 day prior to CDDP administration. Nephrotoxicity was assessed 7 days after the CDDP treatment by measuring serum indices of nephrotoxicity, kidney weight as a percentage of total body weight, kidney’s tissue peroxidative alterations and total nitrate/nitrite concentration (NOx) and the results were confirmed histopathologically. Rats treated with CDDP showed marked nephrotoxicity as evidenced from the significant increase in serum creatinine and urea levels and decrease in serum calcium and albumin levels. Kidneys of CDDP-treated rats showed significant increases in kidney weight and malondialdehyde (MDA) production level and decreases in total NOx concentration, glutathione peroxidase (GPx) activity and reduced glutathione (GSH) content levels. Histopathological assessment of kidneys of CDDP-treated rats revealed extensive tubular necrosis with “sloughing off” of the renal tubular lining cells, intratubular hyaline casts and mononuclear cell infiltration. Treatment with MMF significantly protected the rats against CDDP-induced nephrotoxicity. The rise in serum creatinine and urea levels, kidney weight and kidney tissue MDA production, depletion of “endogenous antioxidant reserve” including GPx activity and reduced GSH content levels and the deleterious histopathological changes induced by CDDP treatment were significantly mitigated by MMF treatment. MMF treatment dramatically ameliorates CDDP-induced renal dysfunction.